If you asked me which small kitchen appliance I wouldn’t be able to live without, it would have to be my slow cooker hands down. I use my crock-pot all the time. It’s a total lifesaver when I need my hands free while dinner is cooking which is a must some days when you have two small kiddos. When I received a copy of the Healthy Slow Cooker Revolution cookbook by America’s Test Kitchen to review, I couldn’t wait to start reading through it! This is the latest volume of their best selling Slow Cooker Revolution series and it contains a well rounded collection of 200 fresh and healthy recipes packed with vegetables and hearty grains. They also include a guide of slow cookers that they have tested and recommend. I find this extremely helpful because after owning a number of slow cookers over the years, I have found that each brand performs differently which can then alter the cooking times suggested in a recipe. It was nice to see every recipe also include the nutritional information per serving along with shopping and prep tips. There are also a lot of color photos throughout which can be so helpful for any new-to-me dishes that I’ve never made before. 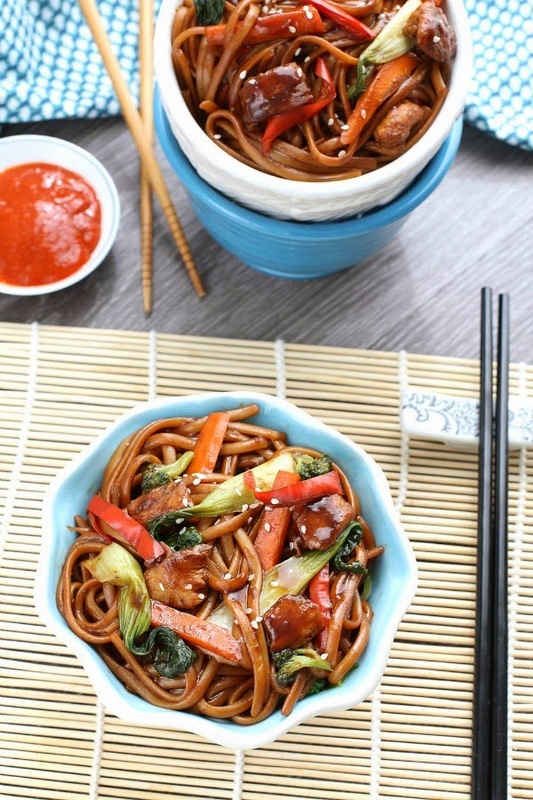 Many of the recipes can be prepped in less than 15 minutes and most of them don’t involve any stove-top time. I’m sharing two of the recipes that I made from the cookbook and I seriously can’t wait to try more. Everything I made so far was full of flavor with minimal prep time. 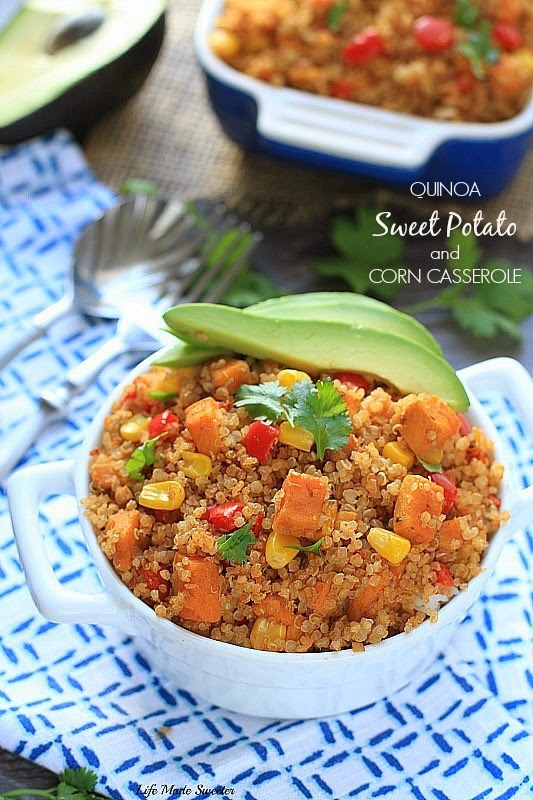 If you follow me on Instagram, I shared this Quinoa, Sweet Potato and Corn Casserole that I made first. I make quinoa at least twice a week but have never made it in the slow cooker before so I was so excited to try this recipe. The sweet potatoes were infused together with the garlic, shallots and some spices. Then they were placed in the slow cooker along with the quinoa, bell peppers and vegetable broth for a few hours. Once they were done, I added corn, avocado and some cilantro to tie in all the flavors. 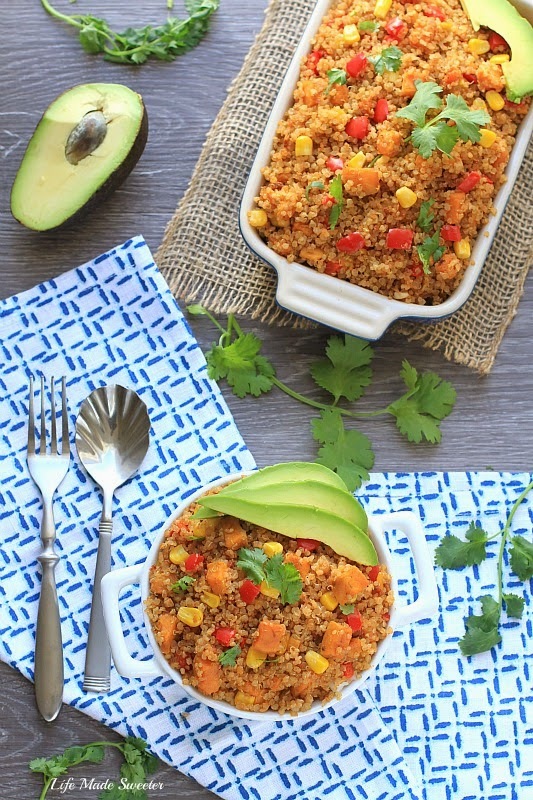 After trying this dish, I think this will be the ONLY way I cook quinoa from now on. 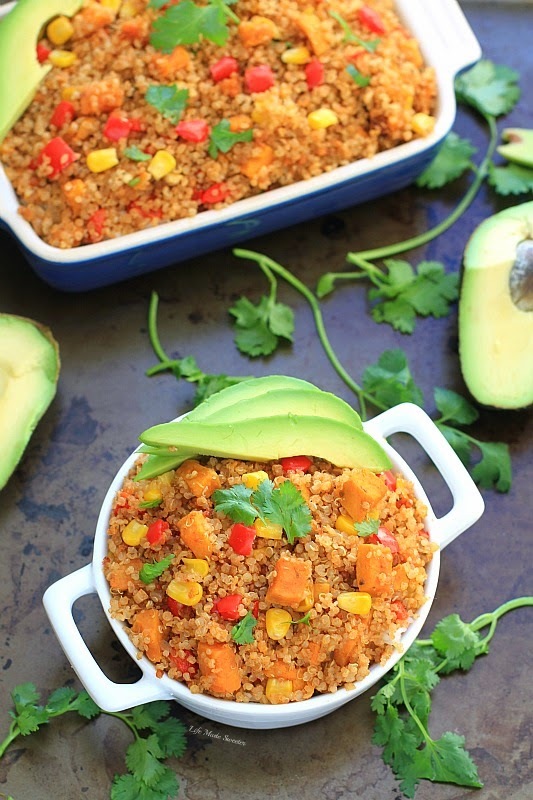 My son and husband are not usually fans of quinoa and they absolutley LOVED this dish which says a lot. The flavors and textures were perfect and the minimal prep time made it even better! Lightly spray inside of slow cooker with vegetable oil spray. Microwave potatoes, shallots, chili powder, garlic, oregano, and oil in covered bowl., stirring occasionally, until vegetables are softened, 6 to 8 minutes; transfer to slow cooker. Stir in broth, quinoa, bell peppers, and 1 teaspoon salt. Cover and cook until potatoes and quinoa are tender; 3 to 4 hours on low or 2 to 3 hours on high. Turn slow cooker off. Top casserole with corn, cover and let casserole rest until fully set, about 10 minutes. Sprinkle with avocado and cilantro and serve with lime wedges. Lightly spray inside of slow cooker with vegetable oil spray. Bring water, half-and-half, 1 cup coconut milk, sugar and salt to boil in saucepan over medium heat, stirring occasionally; transfer to slow cooker. Stir in rice, cover, and cook until tender, 3 to 4 hours on high. Stir remaining coconut milk, coconut extract, and lime zest and juice into slow cooker. Turn slow cooker off and let pudding rest, uncovered, until fully set, about 20 minutes. Adjust pudding consistency as desired before serving; if too loose, gently stir pudding until excess liquid is absorbed or, if too dry, stir in hot water as needed to loosen. 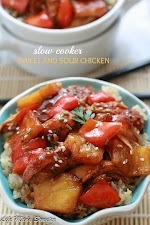 Recipe reprinted with permission from Healthy Slow Cooker Revolution Cookbook by America's Test Kitchen. 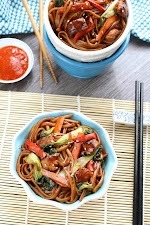 Recipe reprinted with permission from Healthy Slow Cooker Revolution by America's Test Kitchen. Now onto the giveaway! 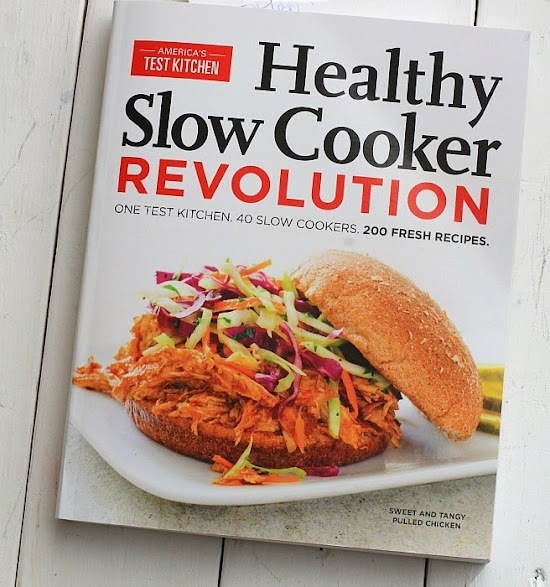 The folks at America’s Test Kitchen have been kind enough to offer one copy of the Healthy Slow Cooker Revolution cookbook for one of my readers residing in the US only. 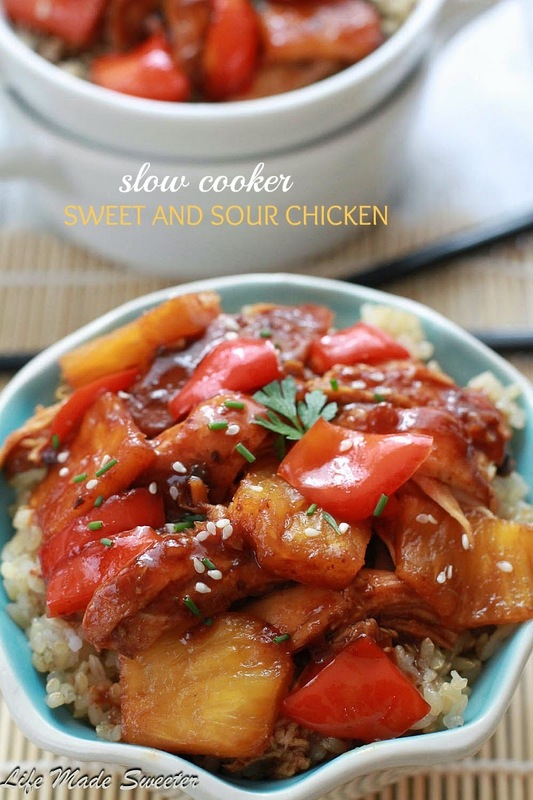 Imagine all the delicious things you could create in your slow cooker too! Make sure to enter with the Rafflecopter widget below. All you have to do is enter your name and e-mail address. The winner will be selected randomly and all products will be shipped directly from America’s Test Kitchen. Looking for more slow cooker favorites? Disclosure: I received a copy of Healthy Slow Cooker Revolution for review purposes. Giveaway is sponsored by America’s Test Kitchen.